Here is my most recent progress on White Wedding. I can see the end of the page 3 tunnel. I really need to get booking on this one since my mom is going to get it framed for my sister and her hubby as part of their Christmas present. Thus, this piece will be my focus over the weekend. I also had some fun waiting for me in the mail today. Last week I got a bit of stash from Stitching Bits and Bobs in the mail. Apparently, I didn’t really remember what I had ordered because today another little package was sitting on my front step. It was Jeanette Crews’ Summer Stitches. 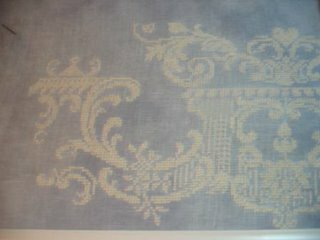 It is very pretty with lots of specialty stitches. I love little surprises like this. What a huge piece White Wedding is. I’m so impressed, I’m not sure I’d have the patience and dedication for such a huge monochrome project. But it’ll be awesome in the end! I searched online for Summer Stitches but only found one by Jeanette Douglas – if it’s the same design as yours, it’s lovely indeed!